Hibernate is the leading ORM (Object to relational) framework in Java world used to implement persistence layer of enterprise Java applications. It was one of the first Java frameworks on ORM persistence and exists even before the Java Persistence API was introduced. It has since then implement JPA interfaces and you can use Hibernate as one of the JPA implementation. In fact, it is one of the most popular JPA implementation in Java world. I receive a lot of email about books and tutorial to learn Hibernate, especially from intermediate Java developers, who has a couple of years of experience in Java but new to Hibernate. It is also a very useful skill to have on your resume because they are a lot of companies who are using Spring and Hibernate to developer enterprise Java application. So if you are looking for a job in Java world, particularly as Java web development role learning both Spring and Hibernate can help you to get your dream job. The new Hibernate User Guide is very good for learning Hibernate, it is most up-to-date and detailed enough to cover all important concepts. It has also become the default Hibernate 5 reference documentation. All the examples given in the book is also hosted on GitHub along with their unit tests, which code snippet will remain relevant in future with new Hibernate releases. Most of the examples have written according to JPA specification but given Hibernate is more than JPA, it also contains some Hibernate specific examples which cover scenarios not covered by JPA standard. The best part of the guide is that it highlights which feature is specific to Hibernate and how you can do same with JPA by giving relevant information. The ORM user guide is fine but if you are someone like me who likes to read the book to get a complete and comprehensive knowledge, you are at right place. In this article, I am going to share two excellent books to learn Hibernate framework. These are the books, which I have read to learn Hibernate in past. Here is the two of the best book in 2017 you should read to learn Hibernate 5.0 and JPA 2.1. There are many other books available in the market but they are either not up-to-date or doesn't cover the Hibernate thoroughly. These two books are useful for both beginners and expert Java developers who want to learn Hibernate. This is by far the best and most complete book to learn Hibernate. 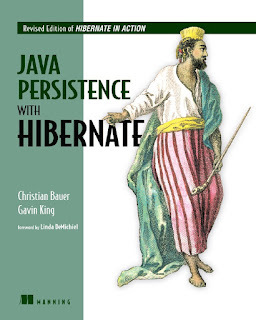 This book was earlier known as Hibernate in Action but from 2006 onwards it was known as Java Persistence with Hibernate. The 2nd Edition of the book has launched in 2015, which means it is also the most to date book to learn Hibernate in the market. It covers Hibernate 5.x & JPA 2.1 (JSR 338) and all examples in the book have been updated for the latest Hibernate and Java EE specification versions. You can also download all examples for free from their website http://jpwh.org. The authors of the books are the real authority in the Hibernate world, Gavin King is the founder of the Hibernate project and a member of the Java Persistence expert group (JSR 220) while Christian Bauer is a member of the Hibernate developer team and a trainer and consultant. Gary Gregory who joins the team for 2nd edition is also a principal software engineer working on application servers and legacy integration. All of them have done an excellent job to keep this book as the go-to book to learn Hibernate. You will learn Hibernate from A to Z in this books, starting from the fundamentals, motivation, and ORM in general, you will also learn more advanced concepts and techniques to solve them e.g. N+1 problems, caching, transaction and concurrency, filtering, hibernate query language, advanced query option and customizing SQL to write high-performance Java application using Hibernate. In short, a must read books for any Java developer who is working or wants to learn Hibernate. This is a relatively new book but, if you want to learn how to squeeze the last performance drop out of your data access layer, you must read the High-Performance Java Persistence book. The author of the book, Vlad Mihalcea is a Hibernate Developer Advocate working for Red Hat and also a known authority in Hibernate, Java, and JPA technology. The book starts with explaining JDBC and Database essentials e.g. ResultSet caching, Statement Caching, creating and maintaining database connection pool, transaction and isolation level and performance implication of them before moving to ORM, Hibernate, and JPA. It covers many advanced Hibernate topics e.g. Inheritance, Relationship, Caching, Flushing, Batching and Concurrency control. In short, this book nicely summarizes challenges and performance implications of using JDBC, either directly or via JPA and Hibernate. If you are working on a Java application which uses JDBC or Hibernate, and you are dealing with performance issues, this is one of the must-read books for you. 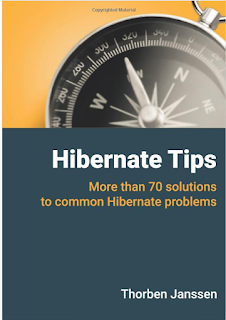 I am glad to announce that fellow Blogger Thorben Janssen has authored a great book on Hibernate, "Hibernate Tips – More than 70 solutions to common Hibernate problems". It shows you in more than 70 recipes (more than 35 exclusively written for the book) how to efficiently implement your persistence layer with Hibernate’s basic and advanced features. Each Hibernate tip consists of one or more code samples and an easy-to-follow step-by-step explanation. You can also download an example project with executable test cases for each Hibernate tip. You will learn how to use Java 8 features with Hibernate 5.0 and more practical stuff like how to call stored procedures and database functions. For the next few days, he is offering the ebook and paperback at a special launch price. You can get the ebook on Amazon for just $2.99 and the paperback for $12.99. That's all about some of the best books to learn Hibernate for Java developers. The new Hibernate User Guide is very good for learning Hibernate and the best part of it that it will always be up-to-date but when it comes to books the Java Persistence with Hibernate 2nd Edition is clearly the must-read books for any serious Hibernate developer. 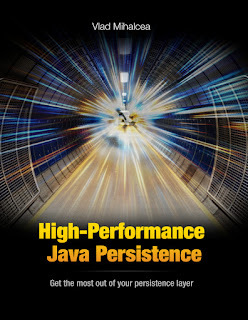 If you want to go next level to solve some real world problems with performance in an application which uses Hibernate or JPA then High-Performance Java Persistence clearly deserves a reading. Thanks for reading this article, if you like this article and find the recommended books useful the please share with your friends and colleagues. If you have any question, feedback or suggestion then please drop a comment. You can also suggest any interesting book about JDBC and Hibernate, I love to find new books.